The manufacturing industry is experiencing a surge in productivity which is leading to an ever increasing need to verify that the parts being produced meet the specified requirements. When timelines are critical and tolerances are growing ever tighter, it is imperative that the quality process involved in reinforcing the part's requirements consistently adds value to manufacturing. The parts manufactured today have increasingly demanding measurements, and are outgrowing the traditional systems used to measure or reverse engineer them. 3D scanning is a cost-effective solution that brings accuracy and versatility to the evolving landscape of the metrology industry. Coverage - In just a matter of minutes, 3D scanners can collect and measure millions of data points on the surface of an object. This efficiency was not possible before the technology was introduced, which is why it has seen such explosive growth in such a short period of time. Speed - Manual measurement takes a long time and is limited by the amount of data that can be practically collected. 3D scanning offers a fast way to automatically collect millions of data points at the speed of light. 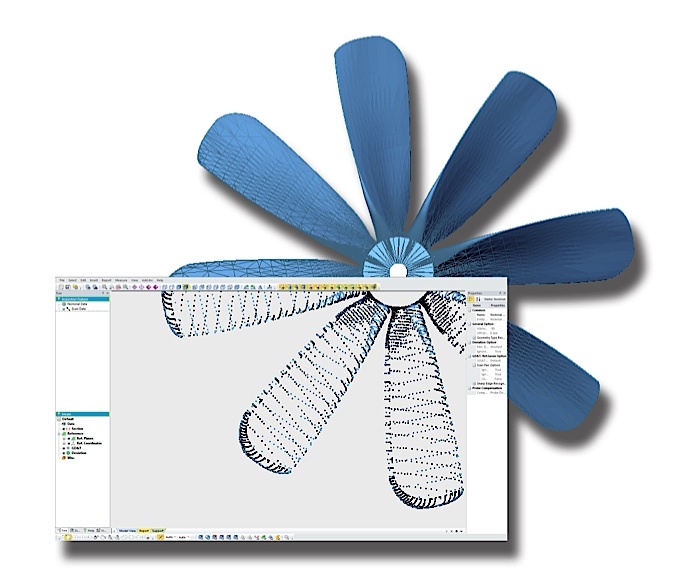 This reduces the time it would take to traditionally produce CAD models of prototypes or 2D drawings for reverse engineering. By increasing the rate of surface data acquisition, 3D scanning brings unparalleled speed to the inspection process. Accuracy - As the technology has improved, the accuracy of 3D scanning has increased over time. Currently, modern scanners provide a high degree of accuracy which is only expected to improve as the ability to collect more and better data points increases. Cost - The price of 3D scanning is competitive with other dimensional measurement technologies, especially when you factor in the time savings. Many 3D scanners are also easier to use, which helps to maintain lower training costs. The type of 3D scanning used will be dependent on the part's surface characteristics such as reflectivity, transparency, and roughness. In some cases, structured light scanning is not an appropriate method because diffraction and reflection can affect the measurements. The best way to decide which type of scanning makes the most sense for your application is to work with a qualified 3D scanning provider that has extensive experience with multiple scanning technologies. 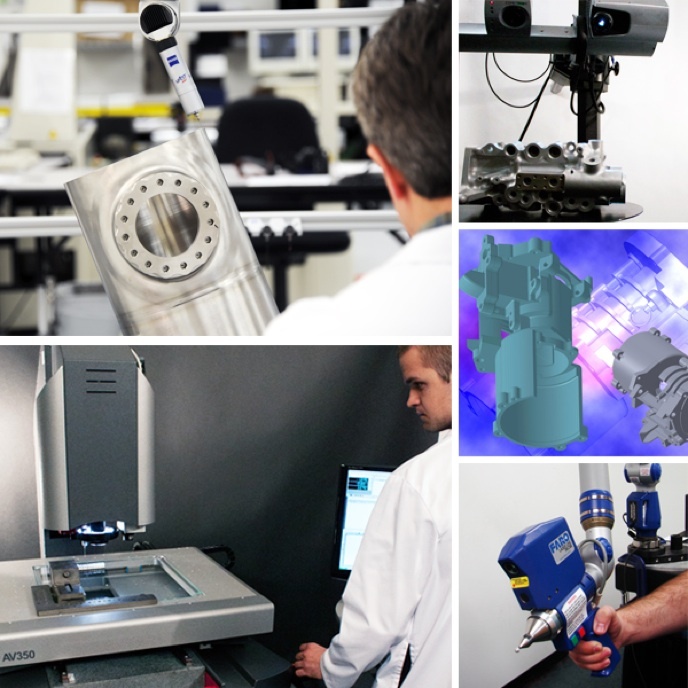 Since 1987, Q-PLUS Labs possesses dimensional metrology expertise and maintains cutting edge 3D scanning techniques. If you need an in-house solution for your application, as a metrology equipment reseller, Q-PLUS Labs works with cutting edge 3D scanner manufacturers to provide customers with objective information on the best fit solution for their application. Contact us today to learn how we can add value to your quality process. California State University, Fullerton's SAE (Society of Engineers) Baja is off to the races with a brand new car to dominate the rugged terrain of this year's International competition track in Oregon. Engineering students from CSUF are not only faced with the task of designing and building a "single-seat, all-terrain sporting vehicle that is to be a prototype for a reliable maintainable, ergonomic, and economic production vehicle that serves the recreational user market," but they must do so while also balancing their daily classes, and for some, their jobs as well. Given such a limited amount of time to build a winning vehicle, there is even less room to spend correcting any build errors. 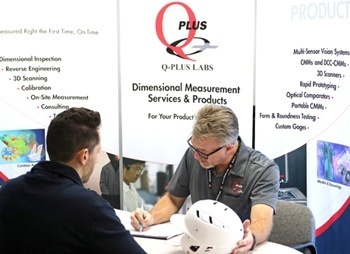 Therefore, quality must be built into each vehicle that the SAE Baja Team designs and manufactures, and Q-PLUS Labs provides them the measurement data they need to confidently drive to victory. Every year, a new team assembles for this legacy project where current class seniors pass on their knowledge to upcoming juniors who will in turn pass that knowledge to their lower classmen. This through the process of raising funds to acquire the components to build the vehicle to "exposure with recruiters from leading companies in the mobility industry to help land their first engineering job after graduation." Each car starts from a design concept that has been modified over the past years of competition, however each new competition requires a new car to be built from the ground up. With each competition, the students face the time consuming and challenging process of designing the car, building the chassis, welding, and various test runs. The team's model this year is named after the mascot of California State University, Fullerton – Tuffy the Titan. The overall design for chassis is consistent with the team's past models, however the significant change this year will be the design of the gearbox. Unlike the previous models, this year's model features a smaller gearbox which consequently decreases the length from the input to the output shaft. This will also push the firewall further back and allow more leg room for the driver, which is important when driving on challenging terrain during the competition's four hour endurance course. CSUF's Baja Team approached Q-PLUS Labs to obtain measurement data for their chassis design. 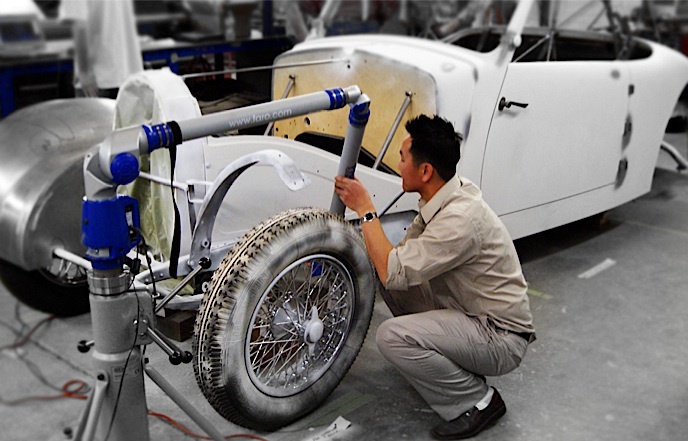 Using a FARO arm, Q-PLUS Labs was able to articulate the probe between the areas of the chassis to collect data on the car's body. 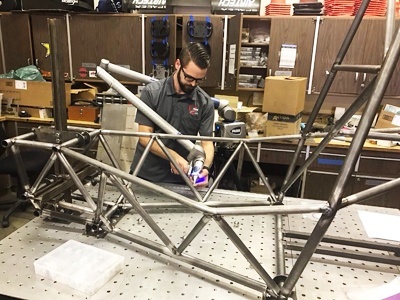 Accurate measurements will help enable CSUF to confidently move forward with manufacturing the components dependent on these measurements, ensuring that their time is focused on the success of the California State University, Fullerton's SAE Baja team in their race this on May 30th-June 2nd. Reverse engineering is not an activity that most people can effectively perform without the help of an outsourced provider. It often requires one or more types of advanced measurement equipment, specialized software, and training to use these tools. Of course, purchasing equipment and performing measurements in-house is possible, but if you do decide to outsource, finding a qualified provider is the first step. When looking for a provider, choose one that has the necessary skills and certifications specific to your industry. In addition to this, there are several other characteristics to seek out. Involvement in your industry - Although it is not a necessity, working with a provider that has prior experience with the types of objects you are reverse engineering will result in a shorter learning curve for your project. Involvement in other industries - It may seem counterintuitive, but a provider that operates in multiple industries is better able to solve the many challenges that can arise with reverse engineering. For example, a lab that has worked in the micro-manufacturing industry might have insights into the best way to reverse engineer a piece of jewelry because it is familiar with small, detailed parts. Problem-solving expertise - Many reverse engineering applications require a certain amount of problem solving, even just to determine what types of measurements should be used. The more experience a provider has, the better able it will be to help with your application. The right equipment - Every reverse engineering application is different, and not all of them require the same type of equipment. For example, many people are familiar with the capabilities of 3D laser scanning, but did you know that it cannot be used for every type of object? Look for a provider that uses multiple different types of equipment so that you can be sure it has the right tools for the job -- and not just the tools it happens to have in the lab. If you are looking for a reverse engineering provider, get in touch with the experts at Q-PLUS Labs. We use measurement equipment of all types for reverse engineering and dimensional inspection. We have also worked with virtually every type of industry and have been exposed to a wide range of reverse engineering challenges. Contact us today to schedule your free consultation. What other factors might you consider when selecting a reverse engineering lab? 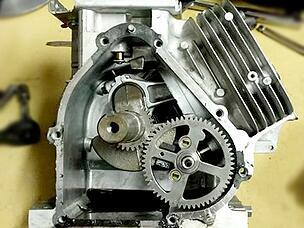 Reverse engineering is used in a broad range of industries for numerous types of applications. Manufacturers and product developers use reverse engineering to replicate worn parts, to convert physical models to digital ones, and to assess the dimensions of objects. However, although it is fairly common in certain industries, that does not necessarily make it easy. Fortunately, some of the most common challenges in reverse engineering are easily solvable with the right approach. Not having the right equipment - Even if you have successfully reverse engineered an object in the past, the equipment you have in-house may not be sufficient for the next object you must scan. Differences in the size, shape, and surface characteristics of the object can impact the types of 3D scanning equipment that are most suitable for the job. To solve this problem, you can either purchase new equipment that matches your needs or outsource to a lab that has the necessary tools. Not having the right software - After 3D scanning equipment creates a point cloud, the data must be converted to a usable digital format. The right software tools are essential for effectively using your 3D scanning data. When selecting software for reverse engineering, you must be sure that it is compatible with your scanning equipment and any other software programs you intend to use. Working with an experienced provider is a good solution for either selecting the best software programs for the task at hand or outsourcing the project if you don't have the tools in-house. Not having the right skills - In addition to having the scanning equipment and software to effectively reverse engineer an object, you need people who are trained to use these tools. Not every company has a team with the right mix of skills for reverse engineering. To solve this problem, you can hire new staff, train your existing employees, or outsource to a qualified provider. Q-PLUS has decades of experience with reverse engineering for a broad range of applications. We also offer multiple types of equipment to ensure that we can scan virtually any type of object. We'll work closely with you and your team to find the best possible solutions for your reverse engineering needs. Contact us today if you would like to learn more or to schedule a free consultation. What reverse engineering challenges have you faced? Whether you decide to outsource reverse engineering services or purchase equipment so you can do it in-house, you must work with a qualified provider that you trust. The reasons may be obvious in the case of outsourcing, but selecting a good reseller when you decide to buy is just as important. Certification and accreditation - The current certification standard is ISO 9001, and the accreditation to look for is ISO 17025. Expertise - Look for a long track record of success in multiple industries, particularly the one in which you operate. Technology - Advances in reverse engineering technology are ongoing. Look for a provider that stays on the cutting edge and adopts new measurement and scanning technologies as they are developed. Diversity - Successful reverse engineering is sometimes a combination of science and art. A reverse engineering provider that has experience across a range of industries and applications will be better able to solve problems and produce the best results. Collaboration - Most reverse engineering equipment requires an investment that you want to feel confident about making. Look for a provider that will help you select the best solution for your needs and not just sell you the device that will boost its bottom line. Diversity - Working with a reseller that carries multiple manufacturers will give you more choices and help ensure that you evaluate all the available options. Flexibility - If you are working with a limited budget, look for a provider that allows you to lease equipment or set up a payment plan. Expertise - The companies that also use reverse engineering equipment are the most qualified to help you decide what to buy. A provider that uses the same devices every day will be better able to help you make an informed decision than a provider that only sells equipment. Installation - Before you buy or lease the equipment, make sure your provider offers installation, calibration, and validation services so you can be confident that you have the proper setup. Training - Look for a provider that offers a variety of training options, especially if your staff will need to learn how to use your new equipment. Support - Sometimes problems arise. You don't want to be left on your own to troubleshoot or to set up maintenance schedules. Also, understanding your equipment warranty is important in order to ensure that you fulfill any requirements. Look for a provider that offers ongoing support so you can get the most from your investment. Whether you decide to buy or outsource, Q-PLUS Labs can help. We meet all of the above criteria and more. We'll work with you to find the best solution for your reverse engineering needs. We'll even help you make the decision whether to buy or outsource. Request a quote today to get started. What do you look for in a reverse engineering provider? If you have decided that purchasing your own reverse engineering equipment is the most cost-effective solution for your project, the next step is determining what to buy. Countless types of equipment are available, with a range of features and from several manufacturers. Sensor type - The object's surface characteristics and other factors will determine what type of sensor will be best for your application. If you're not sure, work with a trained professional before you make an investment to ensure that the equipment you buy will produce the desired results. Sizes of objects - Reverse engineering a car door handle requires different equipment than for a much larger object, such as an airplane propeller. When it comes to purchasing reverse engineering equipment, sometimes size does matter. Shapes of objects - The shape of the objects you intend to measure will play a role in your purchasing decision. For example, you may need to add a bore probe if the object has cavities or holes. Tolerance levels - Make sure you know the required tolerances in order to ensure that your equipment can achieve them. Budget - When you buy equipment, the budget encompasses much more than just the sticker price. Consider other factors such as the costs to operate, calibrate, and maintain the equipment in the long run. In-house skills - Make sure that your staffers have the skills to operate any new equipment you buy. If they do not, you may need to invest in training. Maintenance requirements - Find out what regular maintenance is required before you buy so there are no surprises down the road. In-house capacity - Determine whether the equipment you are purchasing will be able to meet your reverse engineering needs in a timely manner. 3-D scanning an object can take several hours; if you need fast turnaround time for multiple projects, consider purchasing multiple devices or partially outsourcing as needed. Purchasing method - Look for a provider that gives you the option to buy or lease equipment, especially if you're uncertain how long you will need it. If you're not sure what equipment to buy, work with a qualified provider that offers devices from multiple manufacturers. Q-PLUS Labs is an authorized reseller for many different manufacturers. We offer the option to buy or lease, and we can often provide refurbished equipment to help you save money. We also use the equipment in our own labs, so we are uniquely qualified to help you make an informed decision. Contact us today with your questions or for assistance with buying reverse engineering equipment. What type of reverse engineering equipment are you considering purchasing? Reverse Engineering: Should You Purchase Equipment or Outsource? If you need reverse engineering for your business, you may come to a point when you must decide if you want to outsource to a qualified provider or purchase equipment to do the job in-house. How frequently do you need to perform reverse engineering? If the answer is not that often or for a short-term project, you might consider outsourcing as a more cost-effective solution. On the other hand, if you foresee a consistent need for reverse engineering, buying or leasing equipment might be a better approach. How quickly do you need results? If the answer is yesterday, outsourcing is likely to be faster than purchasing new equipment and training staff to use it. If you think buying is a better solution, factor in the time needed to acquire equipment and train your staff. How much can you spend? Working backward from a set budget is a good way to evaluate your options. Remember to factor in more than just equipment costs. You might also need to train staff and pay for maintenance, so the up-front expenses do not necessarily reflect the total cost of ownership. On the other hand, if you will need reverse engineering services for the long run, owning your equipment could cost less over time. What types of objects do you need to reverse engineer? If you expect to scan multiple objects with different sizes and surface characteristics, you might actually need more than one piece of equipment to get the job done. Outsourcing to a provider that has multiple devices can save you time and money. However, if you know you'll be reverse engineering similar objects, doing it in-house could be more efficient. Does your staff know how to reverse engineer? Just because employees are skilled in one area does not mean that they will have the necessary knowledge and skills to use new equipment that they are not familiar with. If you do decide to buy, consider investing in training. Is NIST traceability important? If you require NIST traceability, ensuring that the personnel operating the equipment have the necessary skills becomes even more important. A qualified provider can ensure NIST traceability, or you can train staff so you can achieve it in-house. Can you handle tech support and maintenance in-house? Owning equipment means that you are responsible for calibrating, operating, and maintaining it. If you’re not prepared to do this for the life of the equipment, consider outsourcing. Some equipment resellers also provide ongoing training, support, and maintenance, so if you do buy, look for a provider that offers these services. One approach that many businesses take is outsourcing before they decide to make an equipment purchase. This way, you can ensure that the equipment you are considering is adequate for the task at hand. You will also have time to hire skilled staff or train your existing employees to use the new equipment. Whether you buy or outsource, Q-PLUS Labs is here to help. As a reseller of multiple types of equipment, we offer a large selection of manufacturers. Because we use this equipment in our own labs, we are uniquely qualified to help you make the best selection for your specific needs. If you’re not yet ready to buy, we can perform the reverse engineering for you, either for a single project or on a long-term basis. Get in touch with a representative today to start exploring your reverse engineering options. When we talk about reverse engineering and dimensional measurement, we often refer to manufactured parts, engineering tolerances, and other abstract concepts. Although we don't often encounter this particular type of project, this case study provides an excellent example of reverse engineering in action. Mike M. came to Q-PLUS with an uncommon request and an even more unique story behind it. In 1979, Mike's grandparents hosted a family gathering. All was going well until the smoke alarm went off! After much searching and a hint of panic, the source of the smoke was discovered: A plastic butter dish had fallen onto the dishwasher’s heating element, melted, and triggered the smoke alarm. The unlucky cousin who had loaded the dishwasher looked in and asked, "Is it ruined?" 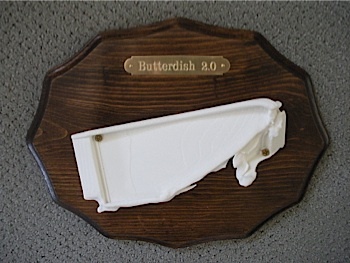 One look at the clearly ruined butter dish sparked hilarity and prompted her grandfather to mount it on a plaque and present it to her. The butter dish became a family award that was presented annually to the person who had done the dumbest thing the year before. For more than 25 years, the not-so-coveted award was passed around the family. Eventually, the original award-winner decided that she wanted this special keepsake permanently back in her possession. What was the rest of the family to do? Mike decided to explore the option of replicating the cherished (and deformed) butter dish to carry on the family tradition. He went to the R&D department at the medical device company where he works and asked if they could possibly make a copy using the in-house 3-D printer. The initial response was, "A butter dish? Sure, we can copy that." But after one look at this butter dish in all its melted glory, the R&D team members decided that it was beyond their capabilities. It was too complicated because the shape was so irregular. However, they did recommend a lab that they sometimes used for outsourcing this type of work. Mike contacted the recommended lab and thought he had found a solution ... until he sent a picture of the butter dish. Foiled again! Still on a mission to continue this unique family tradition, Mike turned to the trusty Internet. He found the Q-PLUS website, filled out the contact form, and got a return phone call in 15 minutes. Unlike the R&D team and the first lab Mike tried, we were not only up for the challenge, but we also were excited about it. What a great story! Unlike many of our other projects in which clients send in objects for reverse engineering, this was a special case. Mike was concerned that a melted butter dish received in the mail would not get the respect it deserved and could possibly get lost (or tossed) after all these years. We scheduled time on a Saturday for him to bring the award in and have it scanned. For the scanner, we used a high-end white light scanner: a Steinbichler Comet 5 4M. There are less powerful scanners we could have used for a project like this, but our team got caught up in the excitement and wanted to produce the best possible results. The white light scanner was used because we needed a massive amount of highly accurate data to capture the detail of the melted butter dish. This device was also selected because it provides relatively fast results and budget was a consideration. This particular project is a perfect example of “as-built” reverse engineering. The goal was to create a replica of the original object, errors and all (and clearly, this butter dish was rife with errors!). On the other hand, if we were reverse engineering for design intent, we would have tried to produce a functional butter dish that matched its pre-melted state. Mike was able to take our digital scan and have a replica made using a 3-D printer. Butter Dish 2.0 lives on, and the family tradition remains uninterrupted. In addition to achieving the desired goal, Mike was happy to learn more about the scanning and printing process. He thought that it was amazing that an object, especially one so complicated, could be replicated so exactly. Now that the butter dish replication problem is solved, Mike's biggest worry is that he will be the next award-winner!